Bromore Cliffs opened its doors to the public on July 5th 2012. 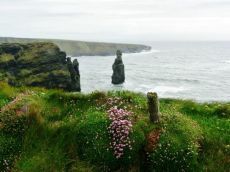 When visiting Ballybunion town as part of the Wild Atlantic Way make sure a visit to Bromore Cliffs is on the cards. Located just three minute drive from Ballybunion is the start of the Cliffs of Moher and a walkway to the land of Folklore and Irish History. Indeed Mike and Grace Flahive can take your group along a guided tour of the Family Farm dating back to 1841. 6 The Haggards Strands,The Periwinkle Hole out to Doon Point and "Sweet Doon Bay"
8 Daisies and Primroses at Bromore Cliffs. Ballybunion B&B has a selection of lovely appointed rooms and special offers. Book today for that special get away.